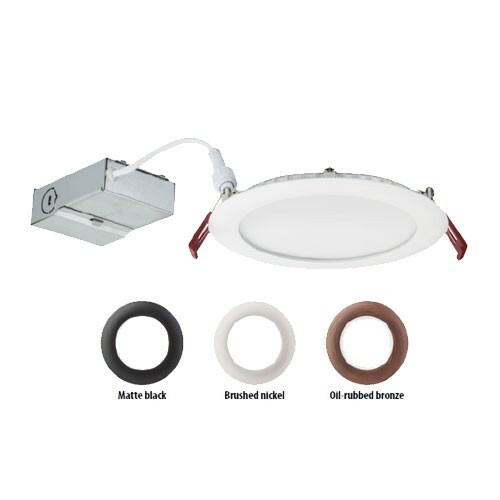 INTENDED USE — The 6" Wafer-Thin LED recessed downlight with remote driver box combines high quality light output and efficiency while eliminating the pot light housing for competitive affordability. This innovative wafer-slim Type IC design allows easy installation for new construction or remodel from below the ceiling without the requirement of a pot light housing. The LED module maintains at least 70% light output for 36,000 hours. These LED Wafer downlights are intended for closets, attics, hallways, bathrooms, kitchens, basements, soffits, entry ways, porches, garages, stairwells, corridors, nursing/retirement homes, condos, elevators, apartments, and any other small areas. CONSTRUCTION — Ideal for shallow ceiling plenum since a pot light housing is NOT required. IC rated driver and fixture - approved for direct contact with insulation. Aluminum die cast outer frame. Durable, powder coat paint to prevent rust. Round fixture with integral edge-lit LED's. Steel spring clip for easy installation. Plenum rated cable connector to connect from module to remote driver box. Isolated driver integrated inside steel remote box with four 7/8" knockouts with slots for pryout. Suitable for pulling wires with the 12 cubic-inch wiring compartment to accommodate up to (8) 14 gauge insulated conductors, or (6) 12 gauge insulated conductors; making the Wafer LED Downlights much easier to wire in 2in/2out (plus ground) daisy-chain applications and contractor friendly. INSTALLATION — Ideal for shallow ceiling plenum; no housing required. Steel spring clip for easy installation. 6" cut out template is provided to ensure a correct sized hole is cut into ceiling for proper installation of the trim. Size of hole should not exceed 6 1/4 inches for this product. Suitable for installation in t-grid and drop ceiling applications. 2" plenum space required for installation of the remote driver box. OPTICS — Wafer-Thin downlight edge-lit LED technology uses light guided plate to distribute light. Polycarbonate lens provides even illumination throughout the space. Utilized 2700K, 3000K, 3500K, 4000K, and 5000K color temperature LEDs. ELECTRICAL — Connect directly to 120V power supply via provided UL recognized driver. High efficient driver with power factor > 0.9. Ambient operating temperature: -40°F (-40°C) to +104°F (+40°C). Dimming down to 10% (See page 2 for recommended dimmers). Standard input wattage is 13W, 79 lumens per watt. Replaces 75W incandescent for 865 lumens and 100W incandescent for 1020 lumens.. LISTINGS — CSA certified to US and Canadian safety standards. ENERGY STAR® certified product. Wet location. Air Tight certified in accordance with ASTM E283-2004. NOM Certified. WARRANTY — 5-year limited warranty. Note: Actual performance may differ as a result of end-user environment and application. All values are design or typical values, measured under laboratory conditions at 25 °C.